Susan Meadow is the publisher of Meadow Publications, Inc.
Start-ups Those buying a business or franchiseOwners wanting to learn the basics of:Goal SettingForecastingBudgetingFinanceSalesAccountingHiring, firing, managing and motivatingMarketingOnline advertisingSocial MediaSelling a businessCrowdfundingCrisis managementWebsite developmentNetworkingOwners making major decisions about expansion, raising cash, incorporating, new location, adding a partner. Business school students and professors Randy Kirk founded 24+ small businesses ranging from retail to manufacturing, advertising agency to consulting, and mail order to Amazon. Kirk consulted with 180 companies: plastic surgeon, dentists, retailers, restaurants, importers, appliance repair, lawyers, acting school, chimney sweep, mortgage brokers, real estate agents. In January, 2018 Kirk founded SoCal MasterMinds and has worked with 25 owners including advertising agency, CPA, managed services, online marketing, precision machine shop. I've owned and operated small businesses my entire life, and I've been helping others become successful running their small businesses for about 40 years through writing, speaking, and consulting. While attending UCLA Law School, I made the decision to pursue business instead of law. Since then I have founded over 20 businesses, fifteen of which helped me pay the mortgage. I am currently building MasterMind groups under the SoCalMasterMinds.com brand, and consulting with several small businesses. "When Friday Isn't Payday" is the cornerstone of my writing career. 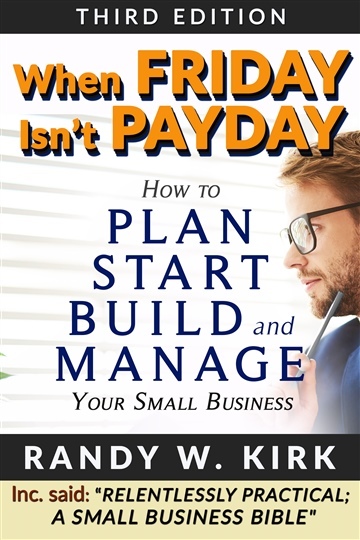 To my knowledge there isn't currently and hasn't been in the past a single volume that covers the journey of the small business owner from idea, through planning, to starting, growing, managing, and even exiting a business. The title says it all: Small business is hard and often lonely. What do you do when your staff expects to get paid tomorrow, and there isn't enough money in the bank? What if you have enough for them, but nothing left over for your own family? Being in business for yourself has questions like that every day. Some are about opportunity, risk, success and some about obstacles, challenge, and failure. I've been there. I can help. I'm an experienced guide, and every page will add to your potential to improve your company and your professional capabilities: Online marketing driving you crazy? We've got you covered with an up-to-the-minute bonus section online that will be continuously updated. Need cash to keep going or make that payroll? From your Visa to the latest crowd funding approaches, the detailed approaches are there. Hiring and firing not your favorite things? Read about methods that will make the process almost fun. More business books will be following that will go into greater depth on many of the subjects covered.